Chinese Premier Wen Jiabao is arriving in Kathmandu on December 20 on a three-day visit, Prime Minister Baburam Bhattarai said on Tuesday. “After the visit of the Chinese Premier, I will visit China,” PM Bhattarai told a select group of journalists. Wen will be the highest-ranking official to visit from Nepal’s immediate neighbours—India and China—since 2001. Earlier, Chinese Premier Zhu Rongji visited Nepal in 2001 and Chinese President Jiang Zemin in 1996. ¶1. (C) Summary: US security assistance to Nepal has brought the ancillary advantage to the US of providing a new arena for fruitful US-Indian dialogue and collaboration. Top Indian diplomats in Kathmandu clearly appreciate not only US support for common US-Indian security objectives in Nepal, but also the unprecedented frequency and candor of our bilateral discussions of Nepal-related issues. Indian military intelligence officers in Kathmandu, however, are openly and persistently uncomfortable with US sales of lethal equipment — and M16s in particular — to the Royal Nepal Army. The following describes a recent discussion with Indian civilian and military officers that provides some insights into varied Indian attitudes toward US security policy here. Embassy Kathmandu remains convinced that US and UK arms sales to Nepal — although modest in quantity and basic in technology — have played a disproportionately influential role in persuading Maoist leaders to agree to a cease-fire and negotiations with the Government of Nepal (GON). We believe our security assistance policy remains valid, and that it offers a continuing opportunity to reinforce growing US-Indian mil-mil cooperation and engender greater bilateral confidence. Positive Indian involvement clearly is key to any longer-term resolution of Nepal’s political and security problems, so it is important that US diplomacy with India accelerate along with our security assistance to this beleaguered kingdom. End summary. ¶2. (C) DCM and DATT met on February 4 with their Indian counterparts to discuss issues raised by the Indian Ambassador concerning US sales of M16 rifles to Nepal. Indian Ambassador Shyam Saran had asked Ambassador Malinowski several days earlier what plans the US had for providing assault rifles to the Royal Nepal Army (RNA). He needed to know how many rifles the US plans eventually to provide, he explained, because he could not justify India’s continuing to supply INSAS rifles if the US were planning to meet Nepal’s needs in this regard. Although Ambassador Malinowski, the DCM and our DATT meet frequently with their Indian counterparts, and have developed unprecedented transparency in their discussions of such formerly sensitive issues as security assistance, this was the first time the DCM and DATT had participated in a joint meeting at the Indian Embassy. ¶3. (C) DCM and DATT began the discussion by explaining the complexity of the US security assistance process, emphasizing that none of the money appropriated in FY 02 for security assistance for Nepal has yet been spent on any military hardware or training. So far, they explained, the USG has committed only to selling the RNA — using GON funds — two orders each of 5000 M16s. The remaining 2000 rifles of the first order (which was submitted by the RNA in May 2002) should be delivered in the next month or two, but the delivery date of the second 5000 is still uncertain. Although the Nepali press persists in reporting that the US eventually with provide 55,000 rifles, this has not been agreed. The DCM pointed out that the US has committed also to providing night vision devices, pilot protective gear, and communication equipment, but these non-lethal items have not been manufactured yet and might take a year or two to deliver. In contrast, the DATT and DCM pointed out, the Government of India (GOI) has been providing Nepal with an accelerating stream of rifles and other military equipment. In our view, India’s leading role in providing military assistance to Nepal is consistent with its proximity, long history of assistance, and strong strategic interest in the security of the Himalayan region. The DCM underscored that the US appreciates India’s leading role, encourages it, and has no competing long-term military objectives here. ¶4. (C) The Indian DCM, Ashok Kumar, agreed readily with the DCM’s characterization of the speed and volume of Indian security assistance to Nepal. He asserted proudly that the more encouraging military situation on the ground in the RNA’s fight with the Maoists was due completely to Indian assistance. Kumar took pointed exception to the DATT’s reference to GOI “”objections”” to US sales of M16s to Nepal. The GOI, he stressed, has no “”objections;”” it has only “”concerns.”” The GOI, he explained, is meeting the RNA’s every request for lethal equipment. It would thus make more sense, he argued, for the US to let India provide arms and concentrate instead on such equipment as night vision devices and helicopters where the US has the comparative advantage. If, however, the US intends to provide rifles, the GOI could not ask Indian taxpayers to subsidize the continuing supply to Nepal of more arms than it could effectively utilize. The DCM explained (again) that the sale of M16s was based on a PACOM assessment in April 2002 of Nepal’s most urgent military needs. If India is planning to fill those needs in the near term, the USG is prepared to revise the profile of its out-year assistance to take account of changing requirements after we meet our current obligations. The Indians refused firmly to provide specific numbers on how many INSAS rifles the GOI planned to provide. Kumar asserted that “”numbers are not important,”” and that he had no interest in getting into “”a numbers game””. ¶6. (C) The DATT asked how the GOI proposed that the USG should approach the M16 issue with Nepal. After a pause with no answer from the Indians, the DATT asked whether they would want us to inform the RNA that after the current order for M16s is filled, Nepal should turn all its arms to India? Kumar again avoided giving a recommendation. He was, however, quick and categorical in rejecting the DATT’s proposal, stating that the Indian supply relationship should not become a subject for US-Nepal dialogue. Clearly, he said, the issue of arms purchases was one the Nepal Government would have to decide for itself. India would have to resolve its own assistance issues by talking directly to the Nepalis. ¶7. (C) In conclusion the DCM pointed out that the US values its strengthening military-to-military relationship with India and has no desire to complicate it with our security assistance to Nepal. On the contrary, our two governments recognize our common interests in helping Nepal to defeat its Maoist threat. The growing frequency and candor of our discussions of Nepal-related security issues are an important benefit of our improved cooperation. 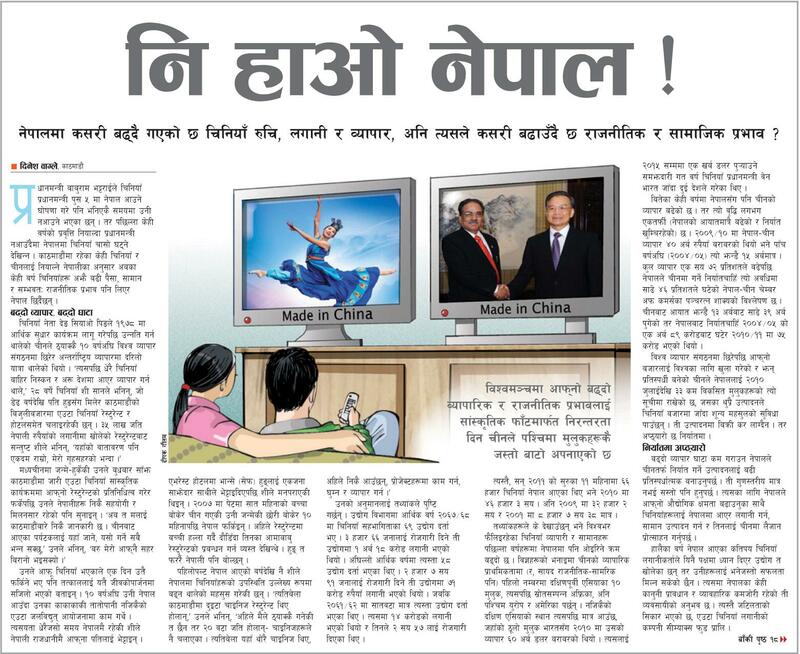 Nepal thus is becoming a theater for bilateral strategic cooperation rather than of competition. The Indian DCM had no final comment to offer on M16 sales and made no explicit recommendation. He concluded on a positive note by saying that we should continue our dialogue. ¶8. (S/NF) Comment: Our frequent discussions with our Indian diplomatic colleagues here in Kathmandu are inconsistent in tone. Ambassador Shyam Saran is an unusually able professional who is comfortable sharing his well-informed political and security analyses of Nepal with our Ambassador and official visitors. We find that we agree in large measure with his views, including his profound skepticism about the motives of the Maoists and his emphasis on the importance of the legal political parties supporting the government. Saran has raised questions about US arms supplies to Nepal, but without complaints or threats. DCM Kumar, an often abrasive diplomat whose pursuit of Indian interests borders on chauvinism, has become more collegial and less plaintive as we have engaged him more frequently in discussions of US security policy in Nepal. Only Defense Attache George Mathai, a long-time Gurkha officer, continues to press our DATT to minimize lethal sales to Nepal, obviously delivering prepared talking points without the benefit of supporting information. ¶9. (C) On February 11 our DATT was told that the Indian Embassy had placed a hold on the delivery of additional INSAS rifles, although the Embassy had not informed the GON yet of that. According to the DATT’s source, the GON planned eventually to transfer the Indian-made rifles to the Nepalese Armed Police, and the Embassy did not want them to recommend that more rifles be diverted from Indian forces for the subsidiary purpose. AMB Saran has confirmed this freeze on further INSAS sales, assuring us that this step was taken not in response to US arms sales, but because he believed the GON was not being candid with the GOI regarding its need for and intended use of Indian-made rifles. — (C) The GOI, like the USG, is attempting to be responsive to Nepali requests for modern combat rifles as an urgent priority. What is frustrating to the Indians is that the Nepalis have never requested India to meet their complete needs for rifles, and have indicated a preference for the M16 as their front-line weapon. For many reasons — diplomatic, economic, military and psychological — the GOI would like the RNA to be totally dependent on it for arms, although the GOI is itself moving toward some foreign military sourcing for small arms. — (C) Indian analysts are increasingly persuaded that the Maoist movement in Nepal poses a security threat to India. 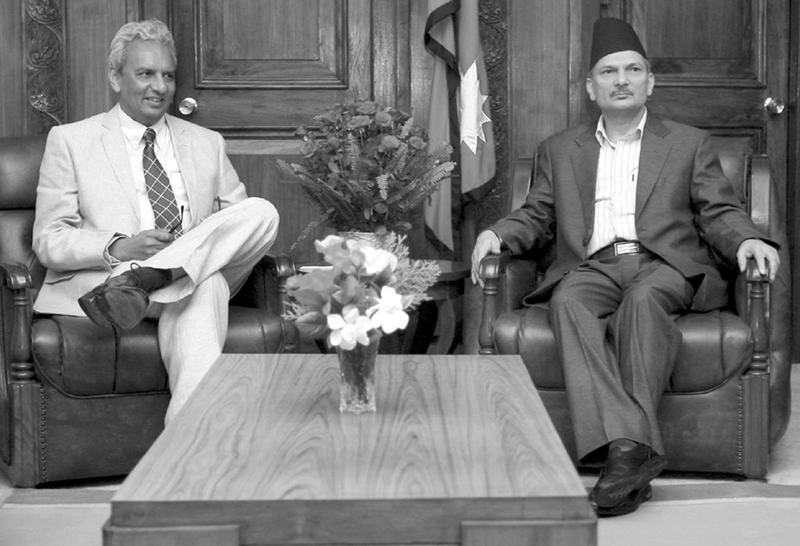 Their dilemma is that they have wider and deeper interests in a secure Nepal than any other nation, but their influence in the Kingdom is constrained by a long history of bilateral tension and suspicion. Objective observers increasingly acknowledge that US security assistance and diplomatic support in Nepal are helpful for the realization of Indian objectives here during this time of turmoil. — (C) Indian attitudes toward US security assistance to Nepal are complex. On the one hand, they are pleased by the growing transparency and collegiality of our bilateral dialogue on Nepal. On the other hand, some GOI elements here apparently are having difficulty coming to terms with growing US and UK military activism in Nepal as a conspicuous dilution of the dominance in military assistance that India has long enjoyed and defended. — (C) Given the tensions already present in Indo-Nepal relations, Indian diplomats here want assiduously to avoid complicating those relations by allowing them to become tripartite — with the US openly becoming an interlocutor in the shaping of the Indo-Nepal security relationship. We suspect that the reported decision of the GOI to hold up INSAS deliveries is another attempt by India to remind Nepal of the extent to which it is beholden to India without explicitly mentioning US arms sales. — (S/NF) At least in Kathmandu, Indian concern about US arms sales to Nepal appears to vary significantly between its civilian and military representatives. Indian diplomats understand the importance to India of enhanced US-Indian defense collaboration, and do not want to jeopardize that, and their own dialogue with us, over so small an issue. Indian military intelligence officers, on the other hand, appear to be more focused on traditional relations and local military equations, and have been more willing to signal their discomfort about our potential competition. ¶11. (C) Comment. The best information we have seen on Maoist thinking indicates that the US and UK’s announced policy of military assistance to the GON, coupled with the first deliveries of our M16 and British-purchased helicopters, has been a major consideration in persuading the Maoist leadership to opt for a cease-fire and political negotiations. The GON has made it clear that, despite eventual peace talks, US steadfastness in providing military support — and M16s in particular — will be an important factor in keeping the Maoists at the negotiating table. Obviously, the positive exercise of Indian military aid and political influence is absolutely key to a final resolution of Nepal’s complex political and security problems. Embassy applauds efforts in New Delhi and Washington (see, for example, Delhi’s useful cable, reftel) to strengthen our constructive dialogue with India on Nepal, and intends to redouble our efforts here to build on our new strategic relationship with India as we press forward with our arms assistance to Nepal. Cable originally leaked by Wikileaks.